My intention for this blog is to disclose the result of my passion of over twenty years of study and research, to all of you, as “auxiliary researchers” in order to directly experience the new method of Astral Algorithm, based on the “free will” and on the “impulse of the subconscious”. 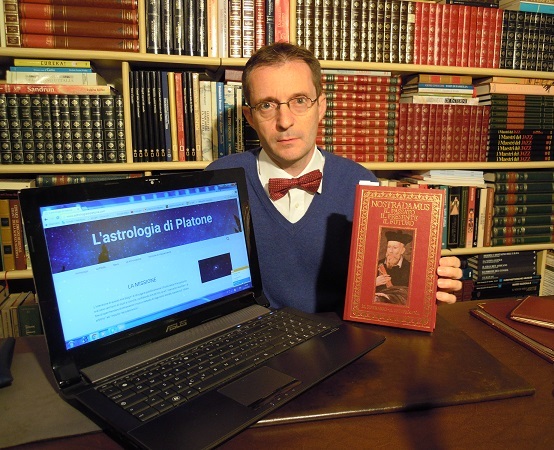 My research is available to all the visitors of my blog and I invite you to directly check your horoscope, by clicking on your zodiac sign. The second feature is the reader’s possibility choose between different types of foresight deriving from the algorithmic calculation of their zodiac sign. The foresight will be suggested by our natural “impulse of the subconscious”, unlike ordinary horoscopes, which are subjectively interpreted by the astrologer and that generate only one foresight. So the decision-making of free will triggers a type of synesthetic experience that affects significantly on the prediction. A sequence and an initial interpretive preface, in an ancient manuscript, which was a legacy for the favorite son César de Nostredame, have allowed me to discover a new key of interpretation of the centuries of the Salon prophet. Nostradamus has handed us down 96 numbers and 4 “oracular” orienteering cards. The astral intersection of the four numbers of each series or sequence, calculated with my algorithm, resultes in 4 key words, inherent to the indicated quatrain of the Prophet while the algorithm around the central sun (in the astral map of the intersection lines) determines a central dominant or the keyword, present in the original quatrain of Nostradamus. condotto a una dominante centrale, ovverosia la parola chiave, presente nella quartina originale di Nostradamus. From the keywords it’s determined an “enigmatic foresight” that can be interpreted differently by varying the positioning coordinates and which represents the future prediction system used secretly by Nostradamus, and that made him the most famous seer of all time. This long and difficult study, led to the creation of the foresight cards that allows you to obtain, based on the information provided by Nostradamus himself, the oracle predictions (horoscopes) reliable, and adaptable to our daily life and to the future.